Experiencing a constant dizziness can be disconcerting and difficult to manage, especially if you are not aware of what is causing this sensation. Dizziness is one of the most common complaints with which women visit their doctor, but because it is a symptom of so many conditions, it can be hard to accurately diagnose. Most of the time, mild dizziness is nothing to worry about; however, it can be a sign of something more serious. Below find a helpful guide explaining more about constant mild dizziness, some of the common causes and symptoms associated with this symptom. Feeling dizzy is something that most of us may experience from time to time. When a woman is feeling dizzy, or experiencing a “dizzy spell”, they will usually feel light-headed, unsteady, or unbalanced and they may also feel weak. Because the symptom is quite vague and can be caused by a wide range of things, it may not always be easy to identify the underlying cause of dizziness. Dizziness is a common symptom that's not usually a sign of anything serious, but should be investigated by a doctor. Hormonal imbalance. 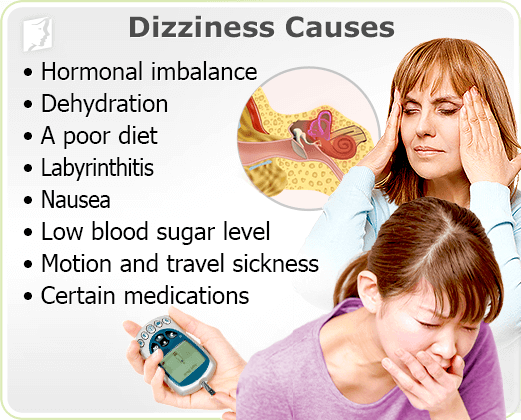 Dizziness may be to fluctuating estrogen levels because the impact on blood vessels. When blood flow to the brain is altered it can cause dizzy spells. Dehydration. The body requires six to eight glasses of fluid each day - if this is not consumed, it is likely that you will experience dizziness among other complaints. A poor diet. An adult woman requires 1800 - 2400 calories every day, in order to store enough energy for normal activities. Without this you can become weak and dizzy. Labyrinthitis. An inner ear infection that affects your hearing and balance, and can lead to a severe form of dizziness called vertigo. Nausea. Whether this be caused by motion sickness, food poisoning, or something else, feeling nauseas often goes hand in hand with dizziness. Low blood sugar level. It is usually seen in people with diabetes. 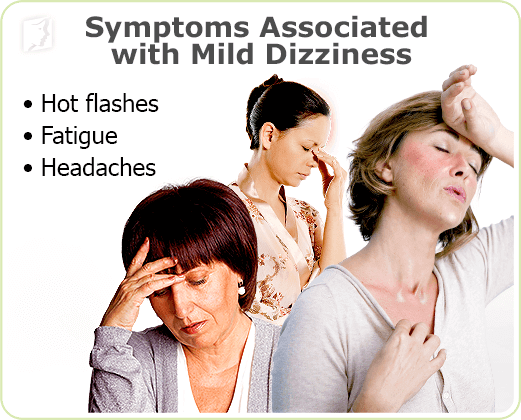 In addition to these causes, unfortunately there could be many symptoms that cause constant mild dizziness. It is well known that women are likely to experience bouts of heat surging through their body during menopause. These usually last for just a few minutes, however; they can occasionally go on for what seems like a lot longer. Feeling overheated can cause dizziness, as you may know from time spent in summer heat. Some menopausal women find that they feel generally more tired and weak during this transition in their reproductive life. It might be that you still sleep for just as long as you are used to, but seem to have less energy throughout the day in spite of this. Fatigue can cause mild dizziness, which may come and go or be constant. Headaches are a common affliction among all women throughout their lives. Depending on how bad your headache is, it could lead to feeling dizzy or experiencing vertigo too. These are just four of a wide range of possible other causes of constantly feeling dizzy. If you do not believe any of these are applicable to you, or if you find coping methods to be ineffective, you should talk to your doctor about your experience. Sometimes, dizziness can be an indication of another, more serious health matter; this possibility can be thoroughly explored if your doctor is unable to determine another reason.